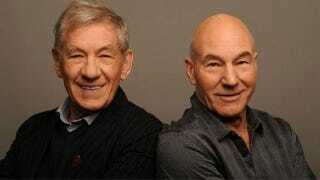 Yes, as unbelievable as it sounds, Sir Ian McKellan will be marrying Sir Patrick Stewart... to Stewart's fiancee, jazz singer Sunny Ozell, in their upcoming wedding ceremony. Because McKellan will be officiating it. I'm sorry, did you think I meant something else? McKellan made the announcement during a recent appearance on The Jonathan Ross Show, which also happened to include appearances by Doctor Who's Matt Smith and Game of Thrones' Kit Harington (check out 11:00 in the video above, although the whole interview is quite fun ). So essentially, Gandalf announced he was marrying Jean-Luc Picard while he was hanging out with the Doctor and Jon Snow. That sound you hear is the planet's fan fic writers' heads exploding simultaneously.